Phase one remodel and addition to living, family, dining, and kitchen areas. Phase two front facade remodel with new windows. Phase three remodel to existing master bath. 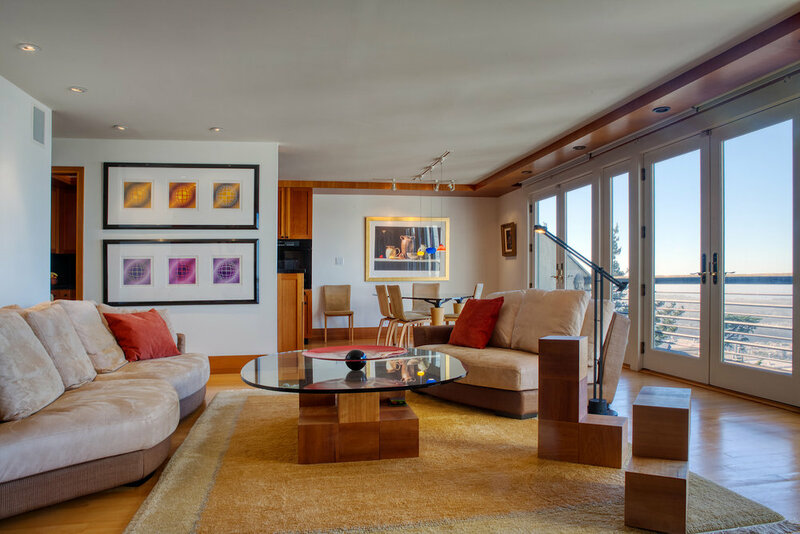 The client wanted to remodel the living, dining, and kitchen areas in this San Francisco residence to create a more usable and fluid space that would also allow for the display of his art collection. The main living area was small and cramped. The deck and panoramic view of the ocean were only visible through small windows facing west. The small kitchen area lacked sufficient counter space but included a breakfast eating area. Situated in the corner of the living area, the existing fireplace appeared awkward and inaccessible. The heating system on the upper floor level needed to be improved. In a second phase project, the client wanted to update and refinish the front of the house. A final project involved a gut and complete remodel of the master bathroom. For the first phase project, the client was willing to sacrifice some deck space on the western side of the house to gain more interior space. A new addition built five feet out from the back wall was crafted primarily of doors and windows opening to the deck and panoramic views. The small addition allowed for a more spacious living area and the expansion of the remodeled kitchen and dining room. We opened up the wall between the dining and living areas and designed the kitchen to flow into the dining space. Re-positioning the fireplace was a challenge, as we had to navigate the flue up without interfering with the level above. We wanted to integrate the fireplace with an art display and lighting, but the space provided few options. We designed custom cabinets to satisfy the storage and display needs and used the cabinets to visually tie the entire open space together. To accommodate the required additional heating ducts needed in the ceiling, we created a wood-finished soffit at the perimeter of the ceiling which also helped to visually tie the open space together. The second phase project gave us an opportunity to give the front of the building an entirely different and updated appearance. We simply built out a new wall in front of the existing wall and reconfigured the windows to accomplish this transformation. The third project involved redoing the master bath. 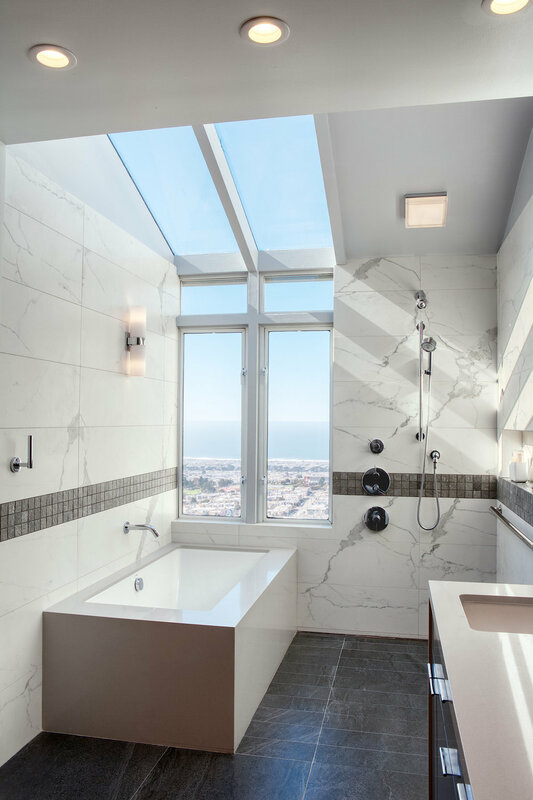 The remodeled bath was designed with a clean, contemporary look. Storage was provided in the wall behind the toilet and in the built in medicine cabinets. The completed living area is both functionally and visually more spacious with a contemporary yet warm look. The display cabinets, fireplace, and renovated kitchen areas are more integrated with each other. The proportions, repetition, and rhythm of various contemporary architectural elements of the interior space create a sense of order. The new kitchen, though expanded only minimally, is much more functional with added storage and counter space. The wood soffit also helps tie the various elements of the room together into a more integrated whole. The remodeled front facade provides a much needed update to the existing house.